"Don't you know who I am?!" 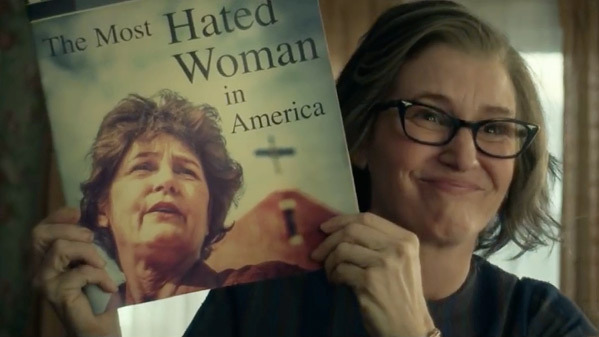 Netflix has debuted a trailer for a film titled The Most Hated Woman in America, which is also premiering at the SXSW Film Festival this month (like many other Netflix films). This tells the true story of the much debated rise and demise of a woman, named Madalyn Murray O'Hair, who was the founder of the "American Atheists" organization. She quickly became the "most hated woman in America", hence the title. Melissa Leo plays O'Hair, and the cast includes Juno Temple, Adam Scott, Josh Lucas, Vincent Kartheiser, Peter Fonda, Michael Chernus & Rory Cochrane. As interesting as this story seems, I'll watch it purely for Melissa Leo. She looks totally unrecognizable, always cool to see. A true-crime biopic about the disappearance of Madalyn Murray O'Hair, founder of the "American Atheists" and pioneering firebrand in the political culture war, The Most Hated Woman in America captures the rise and fall of a complex character who was a controversial villain to some and an unlikely hero to others. The Most Hated Woman in America is directed by filmmaker Tommy O'Haver, of the films Get Over It, Ella Enchanted, and An American Crime previously. The screenplay is written by Tommy O'Haver and Irene Turner. The film is premiering at the SXSW Film Festival this month. Netflix will then release The Most Hated Woman in America streaming starting March 24th later this month. Interested?